If you're anything like me, you can't stand conflict. Tension makes your skin crawl and you'd rather swallow your pride in an effort to keep everyone happy. Being an introvert and a people pleaser, I'm personally inclined to keep quiet while others get loud. However when it comes to running a business, that just doesn't work. I've heard far too many horror stories of creatives being manipulated and trampled by their own good intentions. Whether they slipped into perpetual “yes” mode, got dragged into an endless cycle of revisions, or never got paid for their hard work, these stories used to terrify me as I toyed with the idea of working for myself. How could an introvert and people pleaser be the boss? How could I put on a fierce face and really own this thing? As I've come to learn, the key is to create systems that set you up for success. 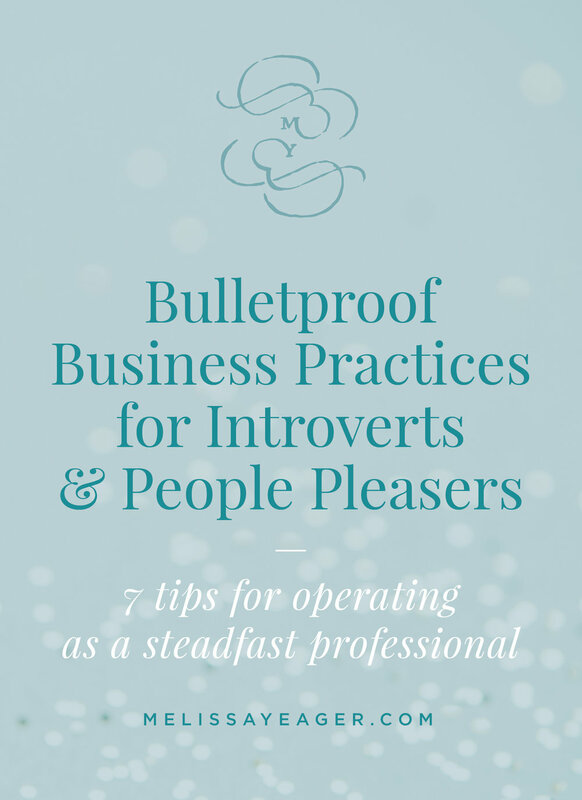 These 7 strategies have helped bring me out of my introverted people-pleasing shell. My hope is that they'll do the same for you too. A quick note: These tips are based on me running a consulting-based business, but there will absolutely be nuggets that other types of businesses can find as well. That said, read on! The first step to setting yourself up for success is to be selective about your clients. You'll need to decide what your priorities are here and what your red flags might look like. Budget, personality, goals, timeline, responsiveness—these are all things to consider. Personally, my contact form helps me learn most of what I need to without a lot of time wasted emailing people that aren't a good fit. This way, I can also collect the information I need before I schedule a call. For people pleasers, a pushy client or someone that seems extra picky can throw up some major flares. If you notice red flags, don't take on that client. I know this is easier said than done, but take it from me—vetting your clients will make it so you never have one of those “clients from hell.” I've been working for myself for almost a year now and can honestly say I adore each one of my clients. How is that possible? Because I'm selective. Figure our how you work best, define your rules, and stick to them. What do you charge? What projects are you not willing to take on? Do you only take on certain types of clients? How long does your typical project take? Are you willing to take on rush jobs? Are there extra fees associated with them? Figure out what your rules are and don't bend on them. Explain these up front so you and your client are on the same page. I can honestly tell you that I've gone against my own process and standards a couple times, and each time I've regretted it. Now I know that I won't take on rush jobs because they stress me out, and I won't skip the brand strategy for any client. This only leads to hollow designs that look decent but lack substance. Don't break process, friends. I promise you, it's just not worth it. We've all had those clients that get a little too bold. Whether it's bossiness, giving prescriptive feedback, or texting us at all hours, let's just say it's not our favorite way to work. But do you know what? It's actually our fault. We didn't set boundaries up front. We allowed this thing to snowball. It's our responsibility to set the ground rules. When we set clear expectations, the chances of a breach go way down. So what does your project schedule look like? Just as you have deadlines on your deliverables, your clients should have deadlines for feedback. What are your office hourse? I only respond to email from 7:30am-6pm Monday through Friday. No nights and weekends for me. Do you know why? Because if my clients see me respond then, they think I'm available then. How can your client contact you? I handle inquiries through email, client meetings over Skype (to keep things personal), and use Asana for project management. It keeps communication streamlined, and for the most part I avoid chatting with clients on the phone. This makes texts from clients a non-issue. Use a contract. You need one. Trust me. This will set the terms, deliverables, and expectations for your work together. I know you may feel like you're inconveniencing your client and they're probably trustworthy anyway, so is it really necessary? YES. The contract protects both of you, and a good client will respect you and see you as more of a professional for using one. Make sure your contract is signed before you start any work. Now sending a pdf contract that your client has to print, sign, scan, and send actually is kind of a pain. But there are plenty of digital alternatives that make this part of the process easy peasy. I use Bonsai, which integrates both my contracts and invoices and makes my life so much easier. I can't recommend them enough. 5. Get Paid First, Then Deliver. Creative work is the same as any other work, and you deserve to be paid just like any other professional. I ensure this happens by getting paid before I even begin. I require a 50% non-refundable deposit before I'll start any project. If the project is less than $1K, I charge 100% up front. I also charge the 50% balance halfway through the project before we start on the next phase. Now this is a bit unique, since most designers will tie that final payment to the final deliverables. However, I've found that if I'm never working for free then I don't have to worry about a client vanishing since they're already paid up in full. This also keeps the momentum going and gives me that extra push of excitement and motivation as we move forward—not to mention being a bit kinder to my cash flow. 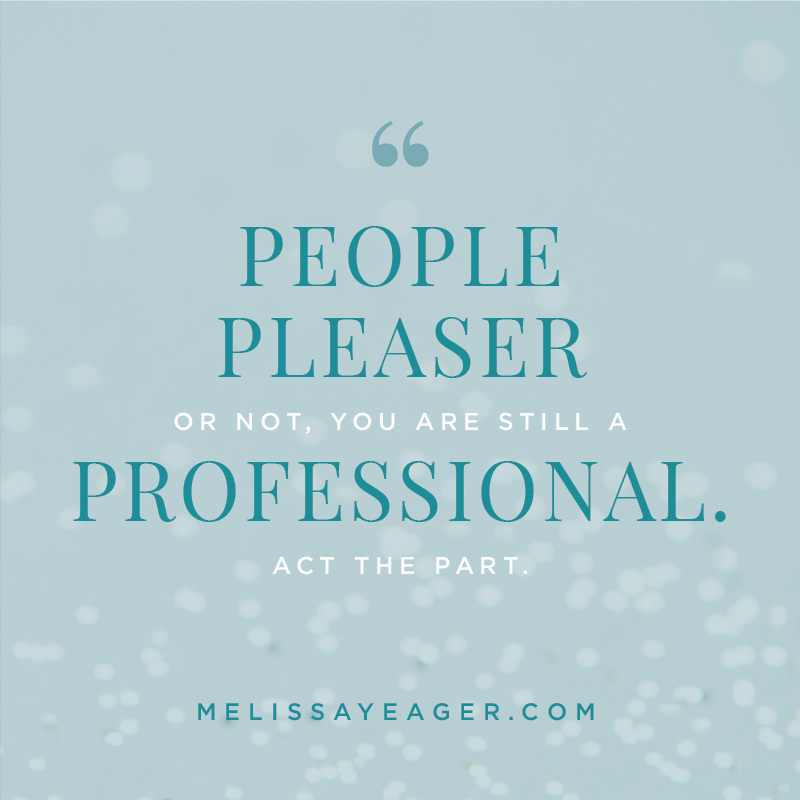 People pleaser or not, you are still a professional. Act the part. If this practice isn't for you, not to worry. Just make sure you require final payment before delivering those final files. Once you send the files, you lose your leverage so get paid first. Worried about that annoying lead time on checks? That's why I use digital invoicing through Bonsai, making things easy for my clients and I. They can pay online and I get the money in my account much more quickly. What about those annoying fees? I build them into my pricing. They're a business expense after all. If you're an introvert and/or people pleaser, it's safe to say that client meetings and calls are the things that keep you up at night. How can you plan for them without caving or stumbling over your words the whole time? Write a script for yourself. I create meeting agendas with bulleted topics ahead of time so I know how to lead the conversation, and so I'm not tempted to trail off and ramble nervously. Before you know it, you won't even need the script. Afraid of caving to sudden client critiques? The key is not to just drop your work on them in a pdf. Present it—piece by piece, page by page. Walk through your rationale, how it supports their vision, coincides with the strategy you've created together, and appeals to their audience. By focusing on how your work solves the problem, you're setting the stage for a much more productive conversation and reinforcing your client's trust in you. My final bit of advice is to show up and look the part. Act sure of yourself, steadfast, and confident even if you don't feel that way. It's a funny thing but that practice of faking it until you make it really does work. With enough repetition and experience, soon you won't be pretending anymore. Trust me, there will be some tough conversations. You will find yourself in new situations you haven't encountered before, and it's scary. But you can't let that fear keep you from doing what you're meant to do. Know you're not alone. We're all just figuring it out as we go, so put on your brave face and get to work. Some of these strategies may sound strict or unreasonable to you right now. You may be thinking that clients will be outraged and that you'll get people calling you out saying “how dare you!” I felt the same way, but you know what? These practices are all facets of professionalism. People pleaser or not, you are still a professional. Act the part. It's your decision how you want to do business, and it's your responsibility to protect yourself and your interests by using systems that work for you. You're the boss. Now get out there and act the part! What other business practices and strategies help you stay on top of your business? Let me know in the comments below!